Rossi's Delicatessen is another Gotham restaurant website, listed on the Citizensforbatman.org website as a group meeting place. 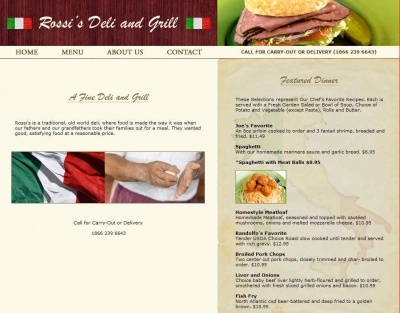 Rossi's is a traditional, old world deli, where food is made the way it was when our fathers and our grandfathers took their families out for a meal. They wanted good, satisfying food at a reasonable price. These Selections represent Our Chef's Favorite Recipes. Each is served with a Fresh Garden Salad or Bowl of Soup, Choice of Potato and Vegetable (except Pasta), Rolls and Butter. All of Our Soups are Homemade. Ask Your Server for Today's Choice. OUR CORNED BEEF IS COOKED ON THE PREMISES DAILY. Our Hamburgers are a Big Half-Pound 100% Chuck, Char-Broiled Medium, unless otherwise specified and served on a Toasted Kaiser Roll. Add Fries to Any Chicken Grille or Burger 1.50 extra. Twelve Years Old and Younger, Please. Joe and Randolfo were talking about those meals, the ones they remembered from when they were kids, and Randolfo asked Joe where they could find a meal like that these days. A good, thick pastrami sandwich where the pastrami was made the way they remembered it. Where meatloaf and mashed potatoes was still on the menu, and someone was making the meatloaf right. They couldn't think of a place so they had to open one. The result was Rossi's. And Joe and Al (Randolfo's son) hope that your family will enjoy it as much as their family does. Due to a shortage of drivers, we are only accepting orders for carry-out at this time. Your carry-out order will be ready in thirty minutes. Birthday special! 10% off on all phone in orders! Today only! When participants called in, a real person answered and took orders as well as questions. The interactions were then collected into a wiretap document in the GPD SID. After the countdown ended on Whysoserious.com/Overture, Rossisdelicatessen.com was "Jokerized," along with nearly every other website in the game. 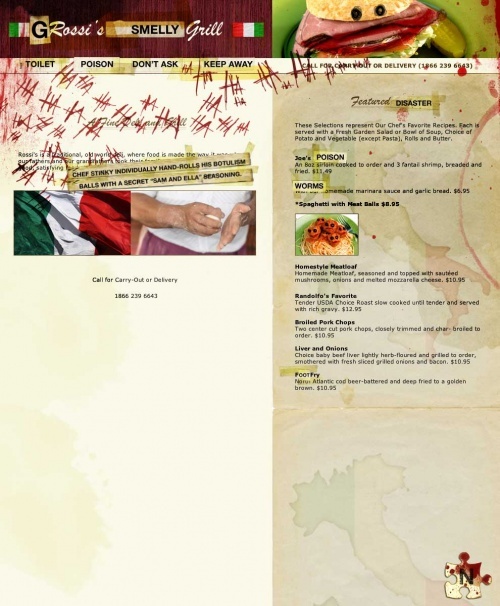 This page was last modified 01:05, 12 July 2008.